Pension Jaskółka is an old farm with 70 ha of ground in Marczow in South-west of Poland. It is a very pleasant family-run hotel under Dutch management (English speaking). The pension has 5 rooms, two of which have sinks with warm and cold water. Toilet and a shower are in the hallway. There is a cosy living room with a big fireplace, where you can rest, read or watch television and a big dining room with a bar. Marczów is very small and situated in a nature reserve that is extremely pleasant with many species of birds to be found, in the nearby woods and fields you also come across deers and boars. It is a lovely and relaxing area. We also rent wooden cottages for 4-6 persons. Inside each one of them you can find a living-room, two bedrooms, a shower, a toilet and a small kitchen. The total size of the cottage is 42 m2 with a 12 m2 porch. 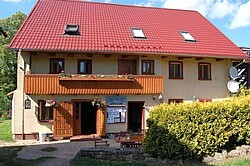 On Camping Jaskółka you can choose a suitable camping-area yourself, we offer basic electricity and water supply. It is great for children, as there is a lot of space and they can play freely without disturbing other people. Dogs are welcome on the campsite as long as they are kept under control.